A new website from JD Wilson, former owner of SCSIforSamplers featuring new and used Card Reader drives for all samplers. 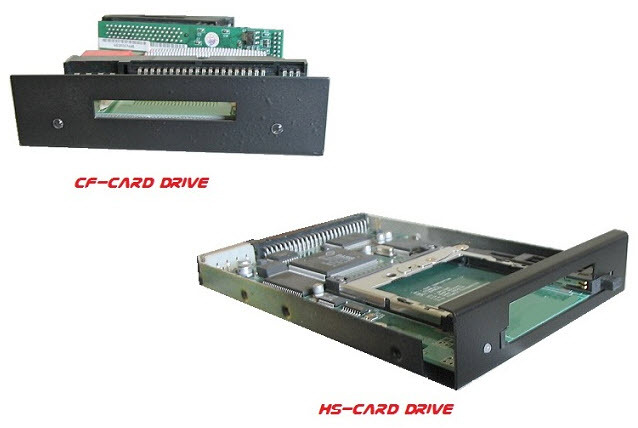 Drives include CF-Card Drives, HS-Card Drives, Solid-State Drive Units, Internal Hard Drives, CDROM Drives, External ZIP Drives, SCSI Drive Install Kits, SCSI Cables, Accessories, and more. Check out the new website below at SCSICardReaders for more information. Now’s the time to get your CF Card Reader while supplies last. A while back I bought one of the internal Card Flash Reader Drives for my Korg Triton Classic and it works beautifully. I have not had one problem since installation and I can highly recommend the CF Card Reader Drives. They fit in many different samplers and I recommend either checking JD’s website or emailing him for any specific compatibility questions you might have. I also recommend picking up a CF Card Drive as soon as you can simply because I’m learning that hardware parts can be limited. There’s no telling how long the drives will be available so you might want to get one now just to be safe. I plan to as well. Finally, I’d like to extend a big thanks to JD Wilson for opening a new site again. I actually have received lots of email from people looking for CF Card Reader Drives. It’s a fantastic service he is providing for the Sampler and Synth community. Thank you! Just put in an order today for a CF-Card reader for my Yamaha A3000. This will be my second drive. I’m glad JD has these drives available again. They work great!! Jim: Thank you very much for that awesome “press release” on my new site. I couldn’t have put it better (or even as well) myself. I have plenty of CF-CARD drives available now (2/5/11), so everyone please contact me if I can help with any questions. I installed the CF Card Drive into the Yamaha A3000 today and all worked perfectly. The installation manual, parts, and performance worked well. I think it took about 30 minutes to install and check everything. Installation was super easy. The Yamaha A3000 works awesome with the CF Card addition and I highly recommend it. SCSICardReaders.com and SCSIforSamplers are both closed. The only place I know of other than Ebay for such devices is the following site which may or may not have what you are looking for. I bought an external scsi for my MPC200 from you a while back. I have the PCI adapter, but lost the disk with the operating system. Can you help me? I am in Yokosuka, by the way, so not to far. Any info you can give me would be greatly appreciated. Thank you. Hello! I think you have me confused with the person who actually sells the external scsi. I don’t sell these nor have I in the past. I just talk about them here on my blog. I think you can find the operating system disk quite easily either on the Yahoo User Groups for the MPC2000 or on the Akai forums. The MPC2000 is still widely used. Best of luck! Real good 2 hear that C.F.Readers can still be bought.I need 2 snap 1 up quick time! Sorry! I think he’s no longer in business and I unfortunately don’t know where he is now. Thanks. I bought a SD card reader from JD Wilson a few years ago and reached out to him to see if he needs help with hosting or domain name management since he is a cool resource and I don’t want him to go away. He keeps loosing his domain names for some reason. I have not heard back and it has been months. Hy i’m a KORG TRITON CLASSIC OWNER AND I NEED SOME HELP ON FINDING A CF READER TO INSTAL ON MY KEYBOARD. I DONT WHANT TO GIVE UP ON THIS TRITON… OTHER THAN MY 01/W I REALLY LIKE IT. HOPING TO FIND ONE…THERES A GUY SELLING THEME ON EBAY BUT HE WANTS TO MUCH $. THANKS.